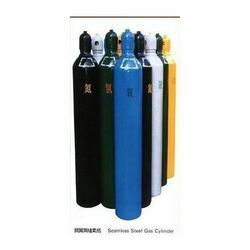 We supply high-pressure Aluminium Gas Cylinder for oxygen and other medical gases, special gases. Aluminium cylinders are the lightweight, corrosion-resistant, combining dramatic weight savings with extended gas delivery and exceptional strength and durability. Automated High pressure gas cylinder body testing system. (Water Jet partial immersion method). SIL’s high-pressure gas cylinders are ideal to store carbon dioxide (CO2) gas, which is used to make aerated water, as a propellant for fire extinguishers, beverages and beer kegs. Owing to the rich industrial experience and expertise in this business, we are involved in providing Ultra High Purity Gas Cylinder(CO2, N2, DA, Oxygen, hydrogen and zero air). Al-Can Exports Pvt. Ltd has emerged as one of the leading manufacturer and exporter of Seamless Aluminium High Pressure Cylinders Aluminium containers, bottles & aerosol can. Oxygen, Co2, Hydrogen, Nitrogen, Argon, Helium, Air etc... cylinders on board , other combination of cylinders, Water capacities and service pressure can be offered on request.We Also sell used cylinders(hydrotested). Owing to the wide experience in this domain, we are instrumental in offering High Pressure Gas Cylinder to our clients. We deal in trading of standardized High Pressure Gas Cylinders. These cylinders are manufactured using quality steel, other metals and latest CNC and other necessary machinery at our vendors end. Widely used in number industries like steel plants, our range is in compliance of both national and international market standards.